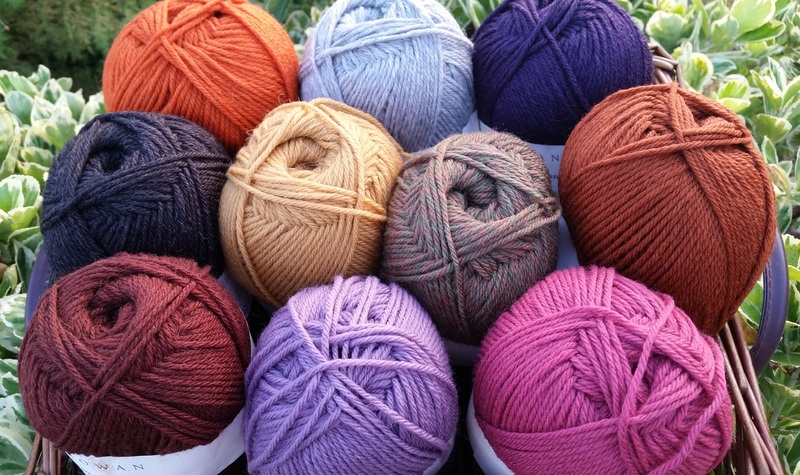 There is a great deal of yarn to be knitted …. …. and so I have three lovely projects to tell you about. For the last three years I have knitted my mother a cardigan for her birthday at the end of November, and she’s loved picking the pattern and the yarn and watching her present grow, but this year, because I nearly lost her in the spring I had to let go of that tradition. That told me that it was time for the Man of the House to have the classic Aran sweater he’s been wanting for a while. He knew that he wanted the classic, cream Aran colour, and I gave him a range of pattens to choose from. I showed him Alice Starmore Books, Rowan magazines, and a few others that I’d bookmarked on Ravelry. He said ‘maybe’ to one or two, but in the end he said that what he really wanted was one like the one my mum knitted for my dad …. When my father died my mother shrank that sweater in the washing machine so the she could wear it. She was very proud of that jumper, and I still have it, draped over the back of her chair. Isn’t it strange the way things work out? My mother is delighted that I’m knitting ‘her’ pattern, and though I would have liked something more modern and more intricate, I like the classic elements in this pattern, and I like that the pattern is very intuitive. One month on, the back is nearly done, and I’m on schedule have a sweater finished for Christmas. In between times, I’m knitting Heike from Rowan 56 for me. I needed some simple knitting, for odd moments when I didn’t want to get into Aran knitting. This is very simple, but the colour-blocking makes it interesting. I had two colour, in Rowan Scottish Tweed, from a project that never happened, and so I just had to buy the third colour. In Rowan Felted Tweed, which I’ve been wanting to try. Progress has been rapid – when I was knitting small things with odd balls of wool earlier in the year I forgot how quickly plain sweater pieces in worsted/ aran weight knitted up. So it’s goodbye to my little knitting resolution bags for now – but not forever. I wasn’t looking for a third project, but I found one that was irresistable. A Kaffe Fasset Mystery Knitalong!!! I love his work and I’ve wanted to get back into colour-work. There are three possible projects and four suggested colourways – I’m going for the cushion in the brown colourway. The clues will arrive every ten days, starting 1st October and finishing a week before Christamas, and I need to knit two 7.5″ squares each time. I think it can be done, with a little more knitting time as the nights draw in. And maybe a few more audiobooks and a few less paper books. I’m thinking my mother will enjoy watching the squares mount up, and the finished cushion will make a lovely Christmas present for her. That all adds up to a lot of knitting, but I’m looking forward to it, because I can’t help feeling that the pieces have fallen into place beautifully. I’ve already done what I set out to do with this year’s knitting resolution – using up odd balls of yarn that had been hanging around the house for far too long – but I’m in the way of always having a small project on the go and so I’m still knitting from my small bags. Seven of the twelve are gone now, and I may knit up the contents of another bag or two before the year is out. 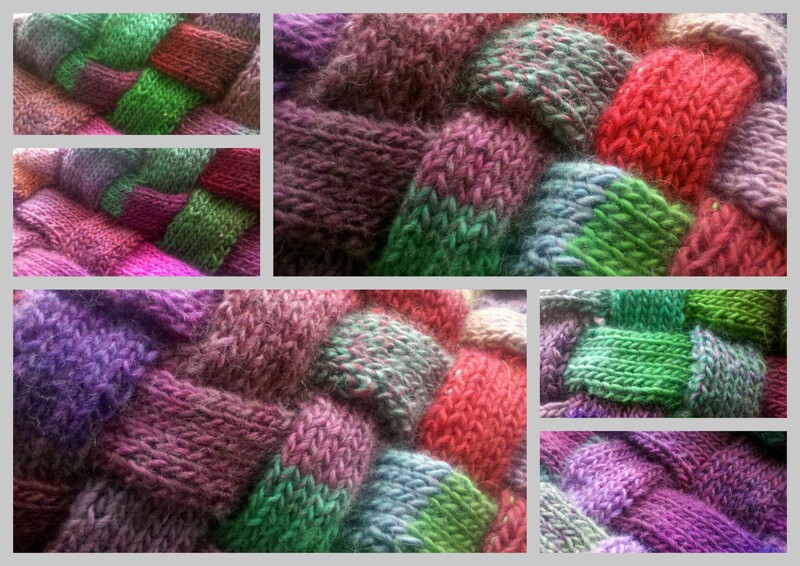 I remember being very taken with a pattern for an entrelac pattern in one of my mother’s magazines, years and years ago. 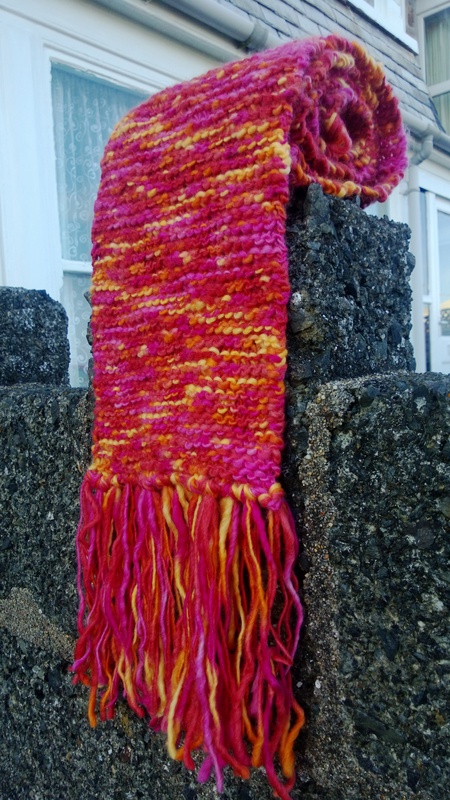 And so when I spotted scarves and shawls using the technique, and knitters getting great results using yarns with long colour changes, on Ravelry I decided that I had to make one. I downloaded a free pattern …. Once you know how it’s done, entrelac knitting is simple and logical, but I’ve learned that you need to be very careful with the edge stitches and with how you pick up stitches. It’s easy to do but not so easy to make the results look polished. I spotted Lang Mille Colori in my local yarn shop, and I was smitten with the bright, jewel colours. They would be too much for a whole garment, but they would make a lovely scarf. Now I’ve knitted with it I can say that I love the colour and the softness, but the thickness of the yarn is quite variable and the balance of the colours is a little off. Green was very dominant in one skein, purple was dominant in another. I don’t regret buying it, but I wouldn’t but it again. One scarf – five foot long by eight inches wide – from four balls! I like it, but I’m not thrilled with it. I’ve already mentioned the balance of the colours, but when I look at the right-hand edge I can see a few places where I wish I’d been just a little more careful. It’s not a scarf to examine too closely, but it will be a nice splash of colour for dog walks on dark winter nights. An Aran sweater for him (hopefully by Christmas!) and a colour-block sweater (easy knitting!) for me. And – because I need a small portable project for nursing home visits – a simple scarf, using some Mini Mochi that I found in the bag with the Mille Colori …. I’m sorry to have disappeared, but I’ve not been entirely well – it’s been nothing too serious, but it’s been leaving me too tired spend much time with the computer, or even to face reading very much, at the end of the day. I’ve just been doing a little bit of knitting and browsing back issues of the Rowan Knitting and Crochet Magazine. And I’ve crossed the finishing line of this year’s knitting resolution. I made up a dozen bags of single skeins and leftover yarn and I vowed to use at least half of them before the end of the year. I now have six and a half bags of yarn used! Fyberspates Scrumptious DK. It’s lovely, and Project 5 used a single skein of the very same yarn. 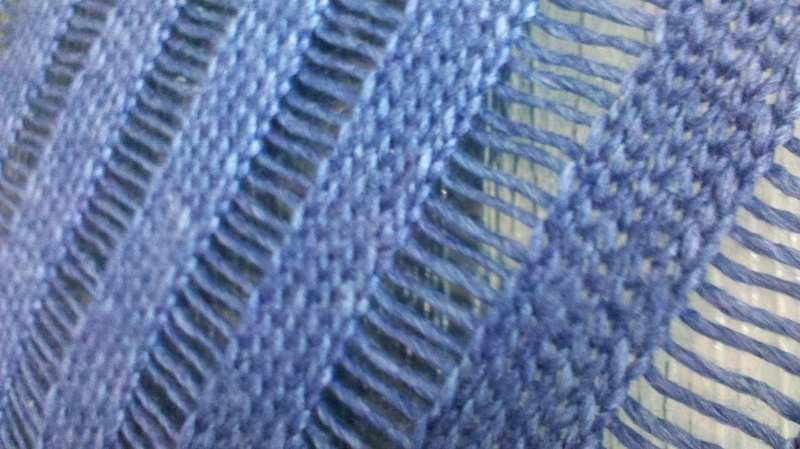 I bought two skeins in a lovely shade of blue with a shawl in mind. I changed my mind about the pattern, and so I put the yarn to one side and waited for the right idea to come along. It’s a free pattern, it’s hugely popular – at the time of writing there are 21, 604 of them on Ravelry, and it’s more of a scarf/wrap than a shawl, and definitely the sort of thing I would wear. I didn’t have quite enough yarn, but the pattern is simple to adjust – I did five repeats of the increase rows instead of seven, so I lost some width but I kept the length. It’s a very clever pattern, much easier than it looks or reads, and once I caught on to the logic I hardly had to look at the instructions at all. You’ll need a lot of stitch markers. Because there are stitches to drop and ladder you’d do best to chose a slippery yarn. My Clapotis grew when it came off the needles, and blocking really paid dividends. 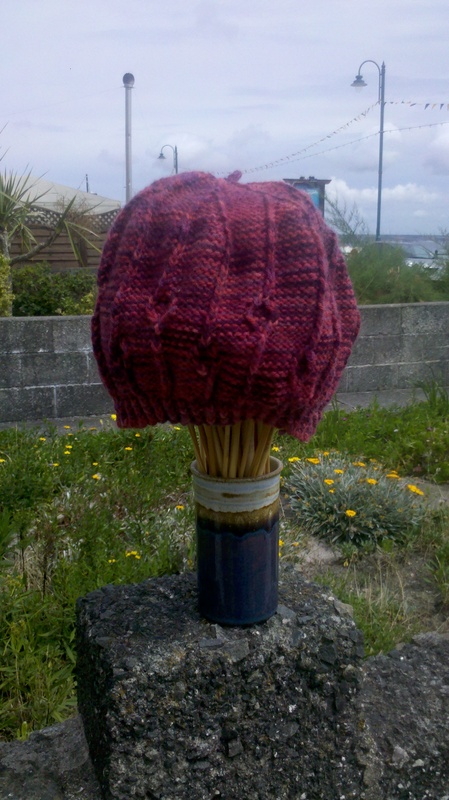 I’d definitely knit another, in a different colour and weight, one day …. I have an entrelac scarf in progress, and I’d like to use up a little more of my project yarn before the end of the year. But I’m working on a much bigger knitting project now, and because it’s rather special I’ll write about it …. one day soon …. I’m still making progress with this year’s kniting resolution. I made up a dozen bags of single skeins and leftover yarn and I vowed to use at least half of them before the end of the year. 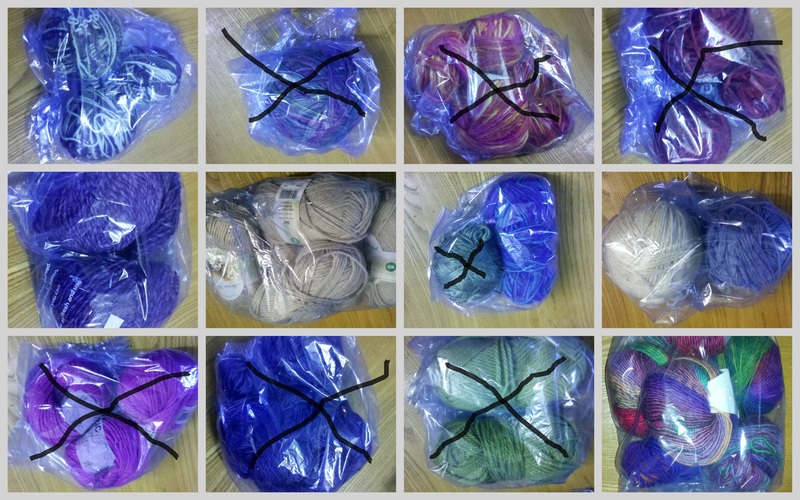 I am very close to my target: six projects knitted and five and a half bags of yarn used! Fyberspates Blue Faced Leicester DK. 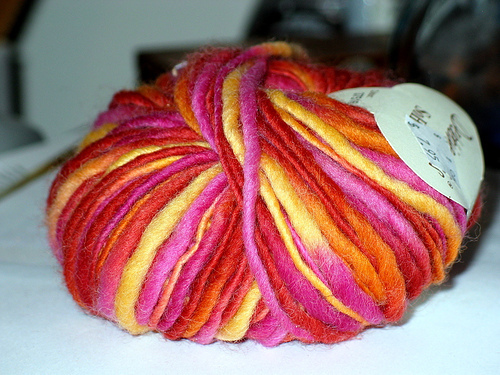 It’s discontinued now, but it was a good traditional wool dyed in lovely rich colours. I bought a pack in a sale, I knitted a cardigan, it was lovely, but I put it in the washing machine on the wrong setting. When it came out it had felted beautifully but it was toddler size. Now it lines Briar’s bed. 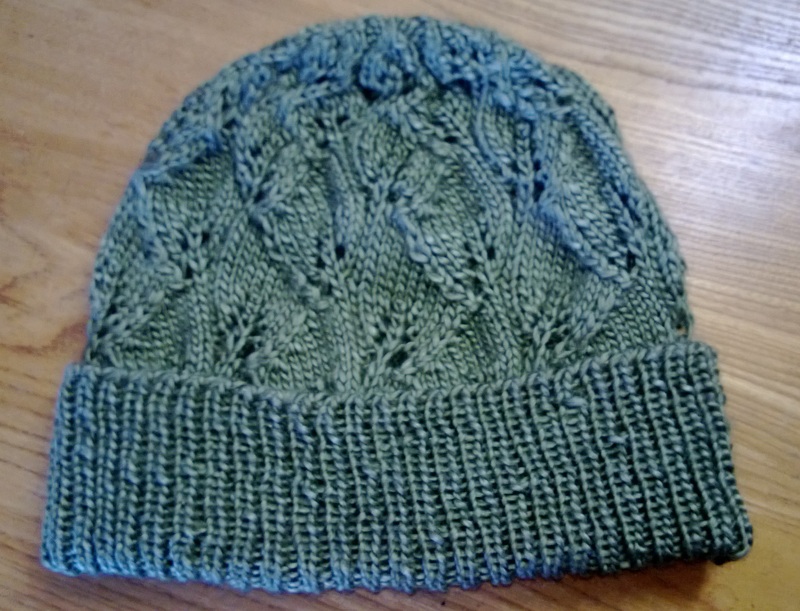 I had a hat knitted from the same yarn on a different shade and it was one of my favourite hats, but I lost it. And so I began to look for a hat pattern …. I started knitting Erica by Woolly Wormhead last autumn, when it was a mystery KAL in her Ravelry group, but the yarn I has chosen wasn’t working and so I put it to one side. I loved the pattern, it just needed different yarn. 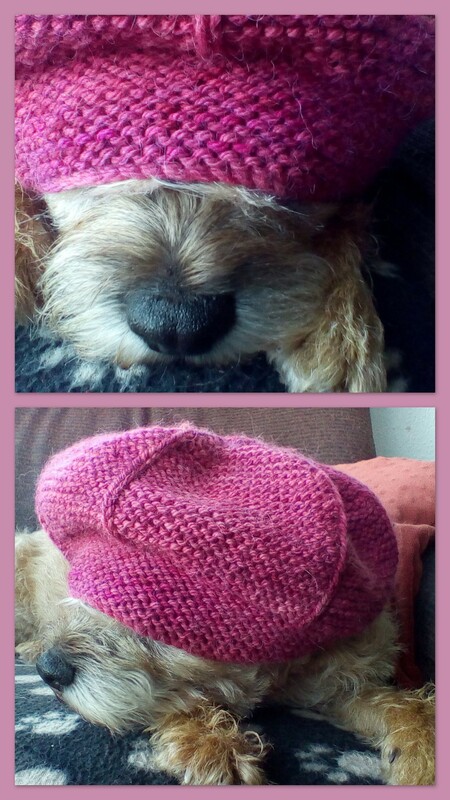 I didn’t have enough yarn for the peaked cap – and I wasn’t sure that it was me anyway – but I had just about enough for the beret version. I had to cut corners just a little as I came to the crown to make sure I didn’t run out of yarn, but I got there with inches to spare, and I don’t think it shows. 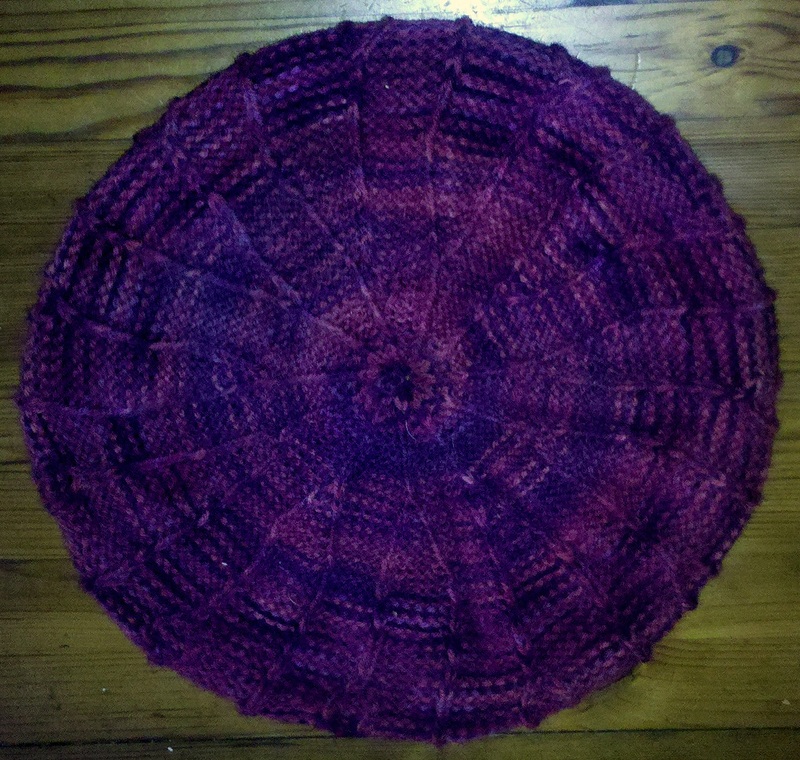 I blocked my hat just enough to make it beret shaped, and I’m very pleased with the end result. I’ve finished the straight section of my Clapotis, so that should be done very soon. That takes me over the finishing line of my project, but I have one or two ideas for the remaining bags, so I’m going to carry on. 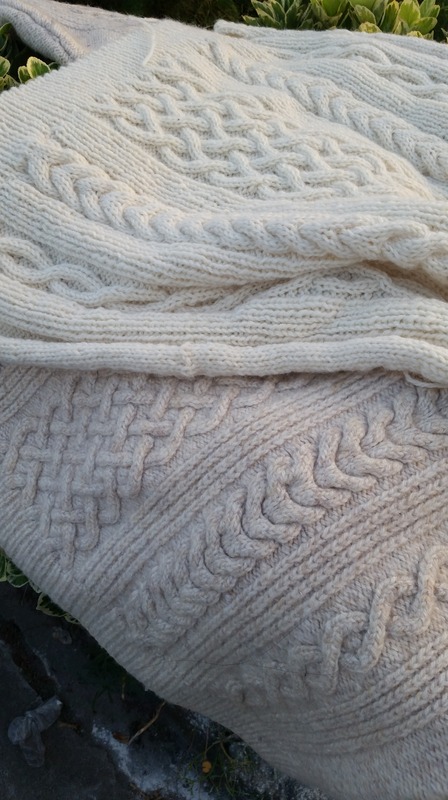 And I have another knitting project – similar but different – in mind for next year already …. Back at the start of the year I made a resolution. I made up a dozen bags of single skeins and useable oddments of yarn and I vowed to use at least half of them before the end of the year. With five projects knitted and four and a half bags of yarn used I’m rather pleased with my progress. 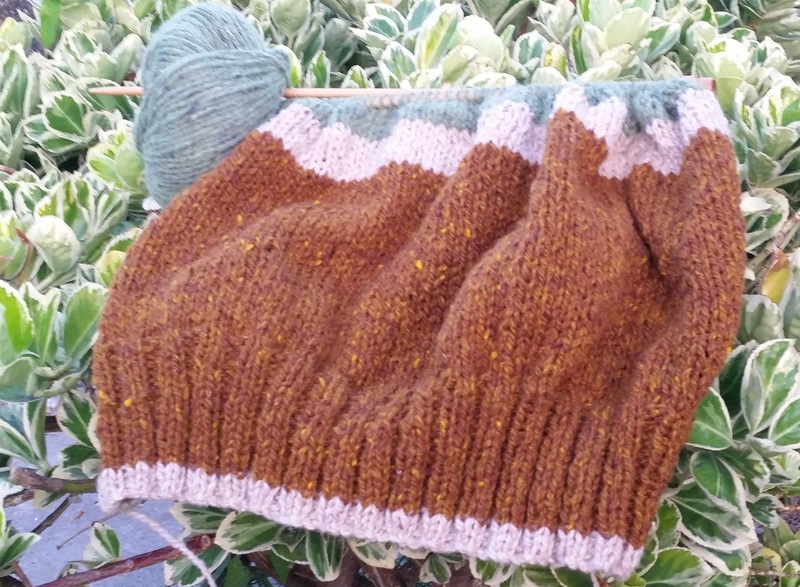 Project 5 was a simple one: I’d bough the yarn with a pattern in mind, I hadn’t change my mind, I just had to knit …. 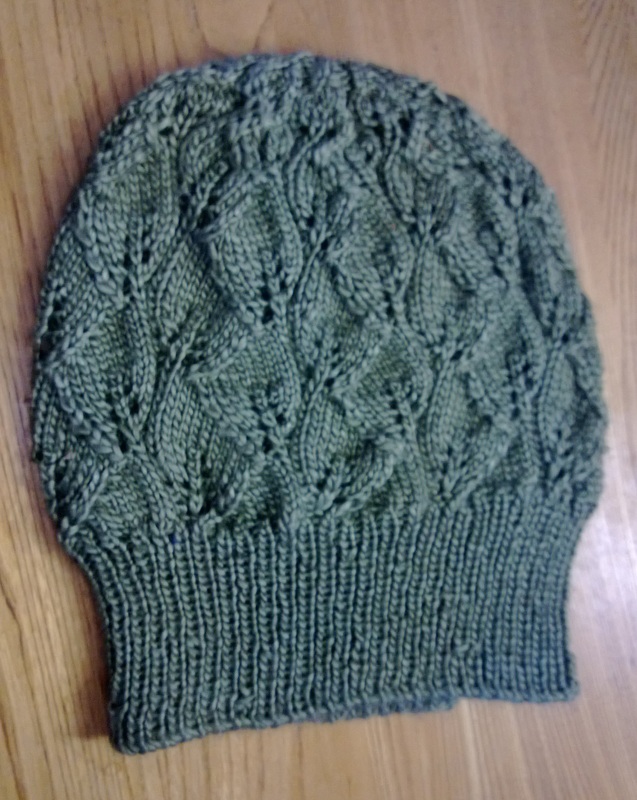 Fyberspates Scrumptious DK in olive green. It’s a gorgeous mix of merino wool and silk, and the colour has such depth. I loved Everglade by Woolly Wormhead as soon as I saw it. The pattern was well though-out and clearly written, and the yarn was lovely to knit with. I would learn that it needed blunt needles to make sure it didn’t split. And that it wasn’t the kind of yarn that took kindly to a border terrier sitting on it …. I gave the body of the hat a light pressing to open out the pattern. There’s another hat on progress. 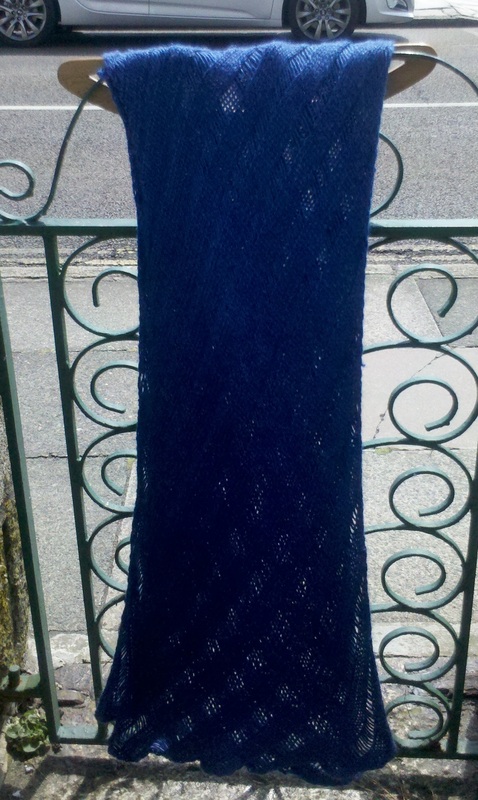 And I have two more skeins of Scrumptious DK (in royal blue) that I have in mind for a Clapotis. It wouldn’t be quite full-size, but it would be big enough …. Back at the start of the year I made a resolution. I made up a dozen bags of single skeins and useable oddments of yarn, and I vowed to use at least half of them before the end of the year. When I reached the half-way point I decided that I had to tackle one of more the difficult bags. The yarn I would have given away if only it had been in complete balls with ball bands …. It was Debbie Bliss Soho. I bought a pack of ten balls in a sale and I had about four left. Beautiful colours aren’t always the most wearable. Thick and thin, loosely plied yarn doesn’t lend itself to many projects. Neither do very short colour repeats. Ravelry came to my rescue – lots of knitters had made My So-Called Scarf with this yarn, they looked lovely and the pattern was easy. I made one and I love it. I tried making a hat with the remaining yarn, but I didn’t like it, I didn’t like the colours of the yarn so close to my face, and so I unripped it. I decided to make another scarf and give it away. My So-Called Scarf eats yarn and I knew that I didn’t have enough to make one a sensible length, so I ruled out making another one. I experimented with a few others, but I just couldn’t find the right pattern. It didn’t work stranded, it didn’t look right in seafoam, twisted drop stitch just looked messy ….. in the end I gave up, I tried plain, ordinary garter stitch; that looked better than anything else, and so I went with it. It was quick, mindless knitting! I had more than 6 feet of scarf after I added fringing on each end! It’s not the best thing I’ve ever knitted, but it’s soft, squishy and very warm. I can’t think of any one who would like it that I could give it to, and so my plan is to donate it to one of the many Christmas fayres that I know will be looking for donations later in the year. I have ‘non-resolution’ knitting in progress, but I see one or two hats and maybe another scarf in the future …..